Whether it’s blower wheels, blower assemblies or axial fans, Morrison focuses on maximizing our supply chain to best meet your needs. We use prime galvanized and galvanneal material from U.S. manufacturers and produce to your design, every time. Our highly skilled team applies lean and flexible manufacturing processes to allow you to meet your ever changing customer needs, often within hours of shipment. Our focus on continuous improvement paired with locating manufacturing near our customers allows us to consistently meet the most demanding customer schedules. 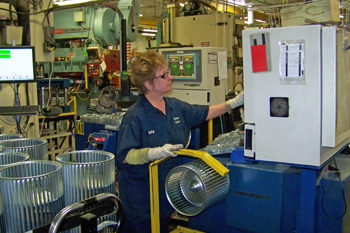 Standardization of processes between our four manufacturing locations means that you will receive the same high quality parts regardless of which Morrison facility produced your order. Multiple locations also ensures that whether it’s an ice storm in Georgia or a blizzard in Cleveland, we will always have the capability to handle your customer requirements from multiple locations when necessary. Your business is secure in knowing that the products you need will be produced flawlessly, efficiently and at the lowest total cost in the industry. 2014 copyright Morrison Products, Inc.